The species is widespread in England and Wales, and although it is absent from much of northern Britain, there are records as far north as Shetland. It is widespread in western and central Europe as far north as Sweden, where it is included in their Red List (Gardenfors 2000). In this country Pholcus phalangioides is found almost exclusively in buildings where it can benefit from the shelter and warmth provided (please note that the broad habitat chart below includes habitats where the spider has been recorded from buildings or huts in these habitats, but the records have not been separated out from these habitats or subhabitats). 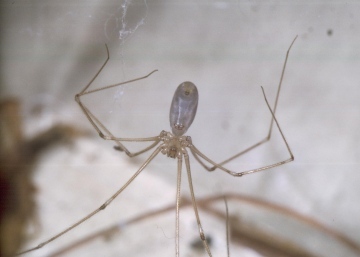 Bristowe (1958) showed that Pholcus inhabits houses where the average temperature throughout the year exceeds 50ºF (10ºC), and north of this the spider is normally confined to cellars where temperature varies little with the seasons and is usually about 50 to 52ºF. In Suffolk a female survived the winter in one of a row of free standing garages, when the night time temperature went well below freezing sometimes for a week or so (J. Daws, pers. comm.). It particularly favours undisturbed parts of houses such as cellars and bathrooms where it can establish large colonies beneath baths and shower-trays. As it makes an untidy web in the corners of ceilings it is not usually permitted a permanent abode in such conspicuous situations but it has no difficulty in surviving where there is a limited tolerance by house owners. It is one of the few species of spider that has acquired a vernacular name, being known as the daddy long legs spider because of its long legs. Adults can be found mature in most months of the year, with possible peaks in males during late spring and autumn.